Becky, Uncorked. : In which I get my Irish life together...maybe. I didn't take this picture. 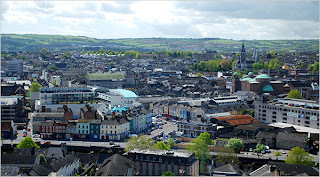 I Googled 'Cork, Ireland'--and you can, too. Oh, hello! I didn't see you there. What am I doing, you ask? Oh, nothing much. I'm just avoiding my homework for a little longer. Yes, you read correctly. I have homework for the first time in five whole months. It's a big deal. Now let me tell you what I've been doing so I don't have to do said homework. Basically, I've been doing a whole lot of nothing. The English department started classes a week later than all of the other departments (not helping our stereotype, guys), so last week I could only go to two of the six classes I'm taking over here. Let me tell you, it was not terrible. Both of the classes I went to are only available to visiting (international) students as well, so the lecturers expected us to get lost and have no idea what to do. I like that in a lecturer. Anyway, last week was pretty calm until Thursday morning, when I woke up with a bout of what the Irish call 'freshers flu.' Luckily, I was able to sleep it off for most of the day and night, though I am really disappointed that I had to miss out on watching greyhound races with the rest of my IFSA-Butler program. It was also Arthur's Day, which is basically an entire day set aside to celebrate the life and product of Arthur Guinness, the founder of (you guessed it) Guinness. Basically, everyone drinks even more Guinness than usual, but for better or worse I was left to mentally salute Arthur from the comfort of my bed. Friday and Saturday passed pretty similarly, with a lot less sleeping and a lot more Harry Potter viewing on my part. Saturday, September 29th, was my lovely mother's birthday, so I also had the privilege of Skyping with a fraction of my family for a good while this weekend. Mum and I pre-departure. I think she might have been more excited than I was. Well, here, look at some more pictures of (part of) my family. Daddy-o. Yeah, now you know why I'm tall. Andy always picks me up when I leave for college. I...don't know why. re-explain that I was leaving for Ireland if he wouldn't get up in the morning. It worked. As you can see, I'm taking six classes, which is actually the equivalent of fifteen credit hours at Vanderbilt (or any other US university) because their credit system is different. Once I get back, I'll have to powwow with the English department head about how exactly to transfer the credits (since these are technically worth 2.5 hours, instead of the usual 3 hours per class), but I'm not thinking about returning yet. That is for another day. The major downside of taking so many English classes at once is that English students have to actually buy textbooks here. Most departments can get by with using the library and Blackboard for readings, but because English classes require so much close reading and continual use of the texts, they also require you to own the textbooks. It's not terrible, though; I've gotten almost all of my books and I've only spent about 150 euro so far. Even with the ~1.5 conversion rate working against the dollar, it's much cheaper than buying textbooks at home. All right, it's time to go put those textbooks to good use. btw I'm just going to keep making creepy, affectionate comments all semester long. 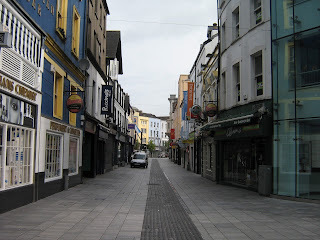 Googled "Cork, Ireland." It did not disappoint. Found this: http://travel.nytimes.com/2009/06/28/travel/28Hour.html, you probably already know these things, but I don't want you missing out on a Butter Museum if it's right there.